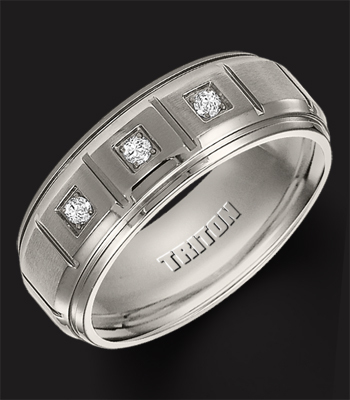 Mens Wedding Bands carries a wide variety of styles of bands to suit the most discerning buyer. We carry rings made of Platinum, Palladium, Cobalt, White Gold, Yellow Gold, Tungsten, Ceramic, Stainless Steel, and Titanium. Our materials can also accompany a wide and eye-catching variety of inlays such as Carbon Fiber, Steel, Silver, Rubber, 18 kt White or Yellow Gold, Platinum, Wood, and other exotic inlays. The factories we have chosen to provide our ring materials are known for their patented, copyrighted creations and carry lifetime warranties against workman defects and breakage. If you have a special style of ring in mind that you do not see among our wedding band portfolio, please contact a member of our sales and customer service staff who will be happy to help you! Platinum is one of the most precious metals in the fashion jewelry industry and is hard enough to be virtually free of minor blemished and scratches for the life of the finished product - such as a man's or woman's fine ring. Costing more than other precious metals because of its rare and beautiful eye-catching appeal, this premium metal is known to be the world's most desirable metal category in fine jewelry! Platinum is more rare than gold and can only be found in certain locations in the world. Because it is so strong and dense this material is used in a number of other areas including in the medical community. Platinum is pure at about 96% in fine metal scales and when compared to gold - another fine metal - it is far more pure with virtually no alloys. This makes Platinum the perfect metal to wear for those who are converned with allergies when wearing gold or other materials. It is typically the alloy content in these other less-pure metals that causes skin irritations. If you are looking to make a fashion statement that very few can make because of the high cost of this pure metal - you might consider wearing a platinum mens wedding band - it will last a lifetime and will never cause you to have skin irritations or become tarnished and blemished as easily as some of the fine metals can become. If you have other questions about Platinum or any of our other fine metal rings please contact a member of our sales and customer service staff at 801-755-1661. Palladium is another precious metal often associated with white gold in that it has a white lustrous finish and is easy to wotk with which is why so many fine mens rings are made with Palladium. Like Platinum, its bright shiny white look stays strong and durable although it is not as heavy as Platinum allowing it to be made into larger pieces of fine jewelry. Palladium was discovered by William Hyde Wollaston in 1801 and has gradually become known as a precious metal category the same as white gold and Platinum. There are many colors of gold including the two most popular - white and yellow. Yellow 18 kt gold has the same amount of gold as white 18 kt gold - they are both 75% pure gold. What changes in these two metals is the type of alloy used to make the gold. For white gold, typical alloys used would be silver and palladium (see paladdium above). Yellow gold is made typically using copper and zinc as the alloy mixture. Some years ago nickel was used extensively when manufacturing white gold but many people had allergic reactions so they changed to silver and palladium even though these alloys are more expensive because they are more rare than nickel. White gold these days is far more popular than its twin - yellow gold. People seem to like the look of the lustrous white finish without paying the higher prices for platinum and palladium. White gold is also a more sturdy and durable finished product than yellow gold in that the alloys used to make white gold are stronger and less resistant to wear and discoloration. Another stunning and eye-catching benefit of white gold is that when diamonds are set in this white, shiny material the result is to make the diamonds to appear more white and firey. Just the opposite for yellow gold in this color tends to send a yellow cast on the diamonds which makes the diamonds appear to be a lesser quality on the color scale than they might actually be. Quick Reference - What types of jewelry are suitable for gold? Men's wedding rings preferred gold type is 18kt if it falls in your budget. Otherwise 14kt and 9kt are both suitable. Stainless Steel has been a popular source of mens rings and wedding bands for centuries because it is a faily easy metal to create and fashion into a huge variety of fashion jewlery - for men and women alike. Stainless Steel takes from 8-12 hours to be created in intense heat in an oven to product the type of product that can be used for rings. This melted product is typically eveolved in an elctronic oven under high temperatures. Virtually all stainless steel is comprosed of at least 10.5% Chromium with another variety of alloys addes such as nickel, nitrogen and iron. One of the many reasons stainless steel rings are sought after these days is that because the metal is in rich abundance the price of the finished product - in this case a mens ring - is low with regard to comparative materials such as cobalt, ceramic, tungsten, etc. Stainless Steel rings are comprised of what is commonly referred to as 316L and they are almost impervious to staining and corrosion because of the Chromium content of the steel. They are thus low maintenance, cost effective and because the metal is softer it is easy to form into a wide variety of fashions, shapes and designs to catch the fancy of men and women throughout the world! For a more complete overview of the features and benefits of tungsten carbide please refer to the "Tungsten" tab above. This sought after material in the mens ring category of fashion jewelry is interesting to follow over the past decade in that it has triped in popularity and shows no signs of falling behind any of the other competing metals such as titanium, ceramic, stanless steel or cobalt. In fact even the white and yellow gold categories have seen part of thier market share eaten into because of the popularity of what is referred to as the contemporary metal category of which tungsten carbide is a huge compotent. Whether it is referred to as tungsten carbide or its shortened name "tungsten" you will find rings made from this substance in virtually all stores whether they are online or in store. Most people in today's world wide shopping space have heard of tungsten and know something of its property(s). It is best know for it absolute dependabilty with respects to its scratch resistant properties and its ability to maintain its lustrous finish and shine forever. There are no other rings that we know of in today's marketplace that have these same characteristics for scratch resistance and lustrous shine that never goes away; virtually all other rings eventually show wear and lose the brilliance of theri shine. In this respect tungsten as been referred to as the ring with the diamond finish - meaning that it is as hard as diamonds nad once crafted it keeps its luster - much like a diamond. Another striking benefit of tunsgten rings for men or women is that they are faily cost effective. Most tungsten rings are sized in 4 and above so that matching rings can be purchased for husband and wife and they size all the way to 16 for the larger hands and all at fair prices - mostly $300 and below while some in this category might even come with genuine stones. If you like color to your tungsten you are now in for a pleasant experience - most tungsten rings are made in classic gray colorations but the newer versions come in white and black and now have white/black tungsten combinations for the most eye-catching beauty yet in this material. Commercial pure titanium is roughly 99% pure titanium or better when considery the type of titanium used in the manufacture of rings - whether they be just plain mens rings or the more fancy wedding bands with diamonds in them. Aluminum and Valadium are the other alloys typically making up a titanium ring. Nothing here to be allergic to! Titanium rings have the unique characteristic of being the highest weight to strength ratio of any material on the market as they are extremely lightweight making them an extremely comfortable ring to wear on any finger! You have probably seen the common forms and colors of titanium rings on the market - a silvery gray color that looks almost liek tungsten but weighs far less. This being the common color - you can now also see titanium in a brilliant black color that is ever growing in popularity - particularly in the United States. The black titanium is crafted to not show scratches and has a huge following in the young-age market - not as much in the 50+ market these days. Another unique feature of titanium is that it is scratch resistant and dent and mar resistant as well - far more than the more "precious metals" such as white, yellow gold, platinum and palladium. Add to this fact the added value of being corrosion resistant and hypoallergenic and you have several reasons why titanium is proving to be the up and coming fashion ring of the century - possibly only 2nd to tungsten carbide which is far heavier and bothers some people who have sensitivies to allergies. Like tungsten, cobalt and some of the other "contemporary" metals it is wise to know your size when buying a titanium wedding band in that they are not actually re-sized - one has to receive an entirely new ring in a new size if the first size is too large or too small. Titanium is simply too hard of a metal to re-size like one might do with a white or yellow gold band. Cobalt in today's fashion ring market is in high demand - extremely high demand and for many reasons not the least of which is the fact that a finely crafted ring with high-grade Cobalt is very hard to differentiate from the finer precious metals such as white gold and platinum. Cobalt has a most unique shiny-white finish that dazzles. Add to this fact that the outer finish is not rhodium plated so their is not finish to wear off over time like platinum. Cobalt does not have allergic properties in that the alloys do not appear to cause any allergies. Cobalt has an amazing ability to remain round without bending like some of the softer precious metals will do over time. It is harder than platinum but not as hard as tungsten so that the outer finish is scratch resistant but not so much so as the other popular contemporary metal - tungsten carbide. Ceramic for rings? Many people think of kitchen appliances and utencils when they think of ceramic. And they think of white - nothing but white. In today's fashion world where experimentation is king, ceramic in all kinds of colors and shapes dots the landscape of fashion for men and women. You will see white of course, but you will also see black and red and tourquoise and all kinds of brilliant and colorful designs these days in ceramic rings. Ceramic for other types of products has a clay base and this is not the ceramic used for mens wedding bands! Often called Titanium Carbide (not Tungsten Carbide) - ceramic for rings is not just hypoallergenic but is virtually scratch proof and has a brilliant long-lasting shine that mirrors that of tungsten. In fact diamond polishing tools must be used to finish the fine ceramic ring. So if you are styling and want to try a new look you might shop the world of ceramic - these rings are created to meet every mood and every pocketbook - ranging in price from the low $30's to the high $700's depending upon what other types of metals you might want your ceramic to be crafted with. At mensweddingbands.com we have some brilliant and stunning ceramic rings made with not just tungsten carbide but with 18 kt yellow gold - a sure eye-catching delight for the most discerning of buyers! Sterling Silver is also referred to as Silver 925 or just 925. The reason for this is because sterliing silver that is used for jewelry and particularly for custom rings must use at least 92.5% pure silver. The balance of the finished product is made up of an alloy such as copper which is the most widely used. If a craftsman were to try and use raw or 100% pure silver the end product would not look as stunning nor would it last as long. Adding the 7.5% copper allows fine artisans to mold the finished silver piece into a mastepiece and what is even more important the finished piece - because it has been crafted with a copper alloy will not to discolor or tarnish like pur silver used to do when that was the only method of creating pieces from silver. Because sterling silver is lighter and more mallable the end result is more exquisite and stunning. You will love the new designs that mens wedding bands has added - they are priced to sell and warrantied for life - including finger sizing! What do you think of when you think of a diamond ring? Expensive? Unique and eye-catching? Stimulating and fresh? Desirable? Worldly and charming? Whatever your thoughts a diamond ring for the man or woman in yoru life is sure to be a hit whether it is a black diamond, a colorless white dimaond or even if it is a smaller one with a few defects seen by the naked eye. Diamonds are forever and they remain one of the hottest and most sought after ring enhancements anywhere on the planet - their rarety and unique patterns make them dazzling! Diamonds are actually crystals made up of carbon atoms that form in the earth and receive their shape and size and clarity based upon a number of factors. Sometimes crystals form together and their growth pattern in this environment make them very difficult to create a stunning and perfect finished product with. Other times extreme heat will affect shpe and size or even splits in the earth;s outer layer will affect the final growth pattern of the diamond. Whatever happens during growth - the end product can be truly stunning when it finds its way into the craftsman's hands! It is interesting to note that some forms of carbon atoms even in pure forms result in totally different products than the diamonds we are speaking of - considering the lead pencil - made of pure carbon atoms like the root of the stunning diamond but the atoms are arranged differently and the result is a black fibery substance ideal for pencil lead instead of to be placed in a yellow or white gold ring to be worn as an adornment for life. Why are diamonds so desirable other than for the look? As you know, diamonds are extremely hard. In fact on teh Mohs hardness scale they are a 10. No known substance on earth naturally occuring is harder than a diamond. That is why diamonds last so long and why they rarely scratch - they are so hard no other substance or metal can scratch them other than another diamond. Furthermore, diamonds resist stains and blemishes and are extremely difficult to break or chip. Even harsh chemicals that can burn through most other materials, metals and fabrics will not even tough the diamond - in fact these same chemicals are sometimes used to clean the diamonds in that they have no ill effects due to the properties of the diamonds that we have listed above. There are many other characteristics of diamonds that one needs t know about when buying including cut, clarity, color and carat (weight). Please refer to "Our Diamonds" above to learn more about our standards when selecting diamonds for our wedding bands.